Natural Bearded Dragon Food – Juvenile Formula | Zoo Med Laboratories, Inc. 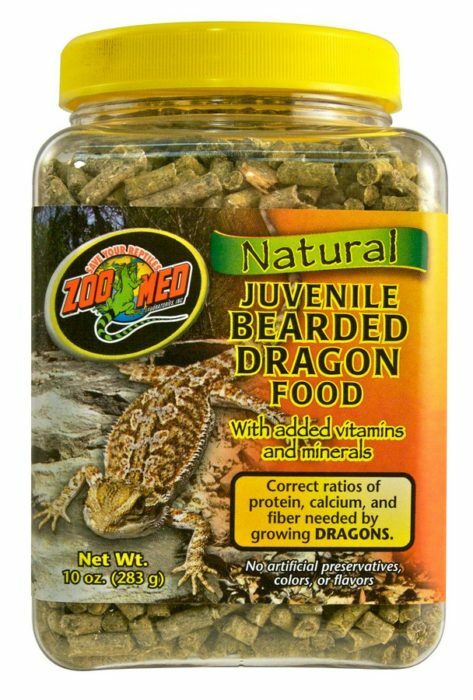 Your Bearded Dragon’s health will greatly benefit from Zoo Med’s Natural Juvenile Bearded Dragon Food with added vitamins and minerals. 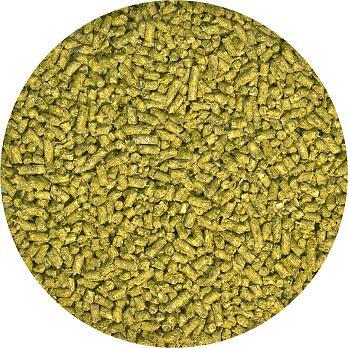 Each formula has been created with your Bearded Dragon’s nutritional requirements in mind. The correct ratios of protein, calcium, and fiber make up these new foods; the Juvenile formula was specially formulated for growing dragons and the Adult formula for the long-term health of adult Dragons. 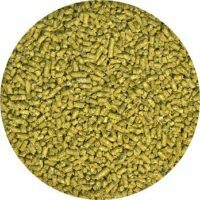 Bearded Dragons will enjoy the flavorful Dandelion Greens and other nutritional plants that make up this new food, especially when mixed with Zoo Med’s Can O’ Mini Crickets and Can O’ Mini Mealies. 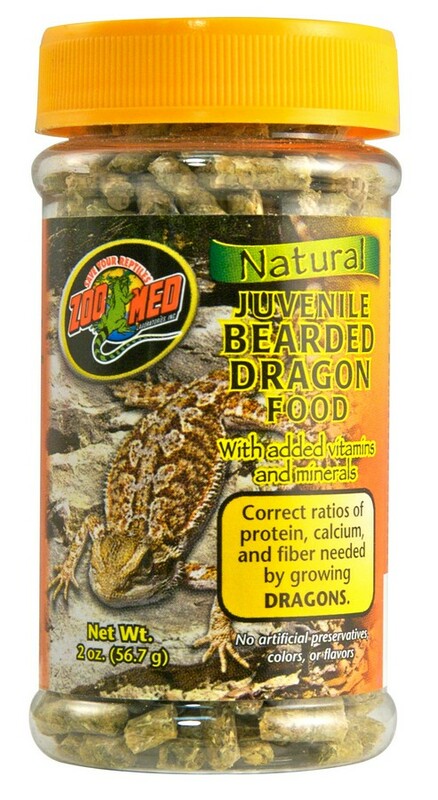 This Natural Bearded Dragon food contains no artificial colors, flavorings, or preservatives. Organic Soybean Meal, Suncured Alfalfa Meal, Dried Lima Beans, Rice Bran, Almond Hulls, Ground Whole Wheat, Escarole, Endive, Calcium Carbonate, Monocalcium Phosphate, Dicalcium Phosphate, Dried Dandelion Greens, Sodium Bicarbonate, Yeast Culture, Dried Lactobacillus acidophilus Fermentation Product, Dried Lactobacillus casei Fermentation Product, Dried Bifidobacterium bifidum Fermentation Product, Dried Enterococcus faecium Fermentation Product, Hydrated Sodium Calcium Aluminosilicate, Hydrolyzed Yeast, Brewers Dried Yeast, Yucca schidigera Extract, L-Ascor- byl-2- Polyphosphate (source of stabilized Vitamin C), Garlic Extract, Anise Extract, Chinese Cassia Extract , Ginger Extract, Horseradish, Juniper Extract, Vitamin E Supplement, Mixed Tocopherols (a preservative), Rosemary Extract (added flavor), Ascorbic Acid, Citric Acid (a preservative), Lecithin, Zinc Methionine Complex, Choline Chloride, Vitamin A Supplement, Vitamin D3 Supplement, Niacin Supplement, d-Calcium Pantothenate (source of Vitamin B5), Menadione Sodium Bisulfite Complex (source of Vitamin K activity), Riboflavin Supplement (source of Vitamin B2), Thiamine Mononitrate (source of Vitamin B1), Pyridoxine Hydrochloride (source of Vitamin B6), Biotin, Folic Acid, Vitamin B12 Supplement, Zinc Oxide, Manganous Oxide, Ferrous Sulfate, Copper Chloride, Calcium Iodate, Sodium Selenite.